Any day you can get in your car and just drive is a pretty good day. And when the roads you get to drive on are endless, unpaved tracts flowing through farmlands and wandering through the woods, well ... life just doesn't get much better than that. So how it is that I didn't run the four day Finger Lakes 1000 road rally last week is a total mystery to me. What kind of moronic excuse did I have for only running the final day? Something about work and paychecks. Next year, I'll do better - I'll buy a season ticket for the lottery tomorrow and start searching, in earnest, for a rich wife. Again this year we loaded up the old Audi and headed deep into western New York. 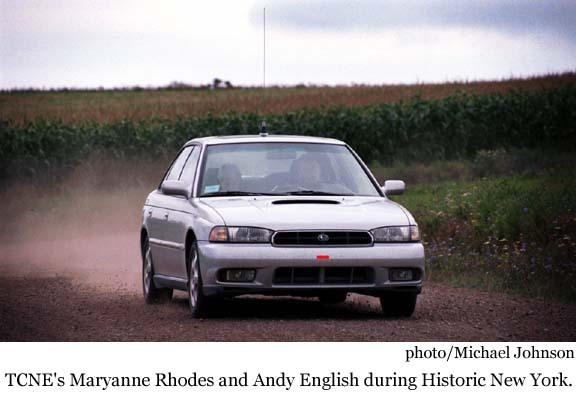 With a newly installed CD player and a suspension that actually works, this was bound to be a great run at Historic New York. I had no idea how much fun it was actually going to be. The youngest of my siblings, Mike, took up residence in the navigator's seat. I've extolled his virtues before, but again, he amazed me. In only his third serious run, he has completely mastered the navigational system we use. He's unflappable. He's consistent. He almost never looks out the window, which may be the best of his attributes, because then he can't tell the family how much of a lunatic I am behind the wheel. Checkpoints are everywhere and, in a fairly unique twist, manned by your fellow competitors. It works like this: two lead cars go out. One stops at the first checkpoint location, waits for the first car and times them. The first car then stops, backs into the control location, times the rest of the cars and then jumps onto the end of the caravan. Lead car number two goes ahead to the second control and stops what was the second car on the road, and then that team becomes the workers for checkpoint two. It works well and allows for a lot of control locations, more than 30 for this event. Some of the controls you never even see until you're past them. It also limits the number of workers, so you can have the route wander wherever you like. Neat. With the brisk speeds and open roads, this is a driver's event. Rally organizers Bill Laitenberger, Debbi Segall, John MacArthur and all the rest have mastered this formula and know how to make it fun. Checkpoints are very challenging to make, at the top of the hills and around the tight turns. From the driver's perspective, there are two things I've learned you need: traction and power. All wheel drive is a big plus, as long as your tire tread is pretty aggressive. Putting on the snow tires is not a bad idea, and at least half the field had taken this approach. (One team was even running Michelin rally tires.) Good tires on a two wheel drive car will work well, too. They say you can never have too much horsepower and this event is evidence of it. A 90 left on gravel when you haven't seen a checkpoint in a while is a daunting thing. Is it hidden before the turn? After the turn? Will you have the distance to make up the time after the turn? Or do you go in ahead and hope you don't get caught beforehand? Or, if you're like us, you're always on the on-time bubble and you really don't have a choice. You're on-time going in and late coming out. This is when horsepower and traction combine to make life a little easier. Unless you drive an Audi that only had 115 horses under the bonnet when new, and that time is some 14 years and 200,000 miles past. Now you take to some more radical means, now you get a little flashier through the turns. 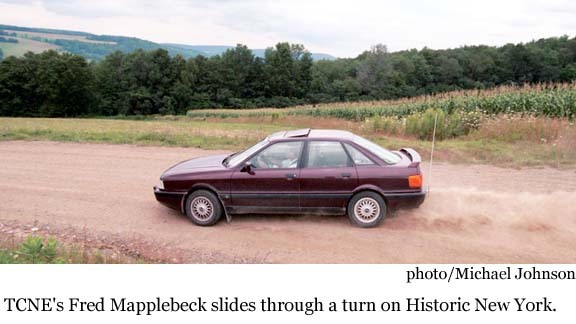 Braking way late, tossing the car into the turn, mashing the throttle as soon as you start to rotate and hoping your very nice street tires bite into something, anything, before you get to the outside edge of the turn. This is how we spent the day. The video tape shows a lot of steering corrections, and my arms were a little tired. But we only slid wide once and that was fairly inconsequential in the end. At the time, though, I thought we were in big timing trouble. Last year, there was this road, Angel is all it was designated as, and it is a devil of a road. Hairpins on loose dirt at a really steep grade. I resorted to questioning the CAS and screaming, "CLIMB! CLIMB! CLIMB!" Of course, mid way up is the checkpoint. Lots o' points there. This year, I recognized the instruction and started to build up a little speed. There's several locations for controls Ð at the bottom, midway and top of this little torture test. I figured if I was early at the bottom, on time in the middle and late at the top, that was the best I could do. Until we slid way wide at the bottom of the hill on the first left-hander. Didn't hit anything, and the car was back in first and accelerating before the sideways momentum had given up. Control was about midway up this year and we were alright. Mike, making a casual note of the ongoing situation, muttered, "I just can't work in these kinds of conditions." This was later followed by, "Luck? HAH! We don't need luck. What we need is a miracle." The Pyrrhic Rally Team now has a motto. Two other moments along the route. All the teams have CB radios in them, only to be used to warn of local traffic on the narrow roads. We heard two reports of a large dump truck oncoming, but didn't catch the mileage. We were in a fairly narrow forest section, entering a short straight away, when, through the woods, I saw something rather large and non-organic. A very large 10 wheel truck, taking up more of the road than was there to be taken up. A quick flick across a shallow ditch, into a small clearing, back over the ditch and onto the road. Bang, checkpoint. Thankfully, the crew (Fred Mapplebeck and Hugo Brunert) had made note of the dump truck and heard our bajaing and we were granted a minor balk. The other event was what coined our phrase of the day. We had what could only be called a math cloud Ð neither Mike nor I could add 100 minutes to a key time. By the time we figured it out, we were half a minute or so down. I suggested the TA, Mike said go for it. Hey, always listen to your navigator, right? Zip, zing, slide. Through the woods we went. 40 late. 36 late. 28 late. 20 late. Then there it was: at the crest of a hill. The sign. The guy with the clock. Zoom, by them we flew. Sixteen down. And I do mean flew. Because that road, over the crest, dove right. I don't know that we ever left the ground, but that 3,000 pound hunk of finely engineered German steel certainly went on the SlimFast plan and got real light. We came down on the front left corner of the car, fully compressing the new spring and strut. But we were still on the road. Then the car started to slide left. Steer into it, too much, it goes the other way. Steer into that, too much and back around it goes for another counter steer and then catch it. Third time's the charm. We were straight, on the road, and still making up time. Mike refers to this as the "Wobble of Death." Congratulations to TCNE's Fred Mapplebeck who, teamed with Hugo Brunert, took top honors in Class S with 83 points. Maryanne Rhodes and Andy English took fifth in a packed Class E with 71 points. Thanks again to Bill, Debbi, John and all the rest of the fine folk out west. They have always made us feel welcome and with the quality of the events they run, we will always come back. Ink us in for the full 1000 next year, work be damned.